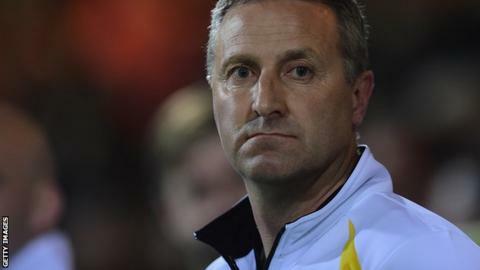 Norwich City boss Neil Adams has said he hopes to be given enough time to improve the club's form. The Canaries have won once in 10 matches after which ended with boos from home supporters at Carrow Road. "It's a tough time for us all - players, staff, supporters," he said. "We all want the best for this club. "I hope I get the time. Of course it's a results business, we're well aware of that. You have to win games." Norwich laid out their target in the summer of winning an immediate promotion back to the Premier League after last season's relegation. And Adams, who made a strong start to the campaign. Norwich have just seven points from their last 10 games having taken 20 from their first nine. But after sitting top of the Championship at the beginning of October, the Canaries have fallen to 11th and taken just seven points from the last 30 available. Home fans voiced their displeasure after the defeat by Nigel Adkins' Reading, who won through two Jake Cooper headers. "You are going to be under pressure now because results are not in keeping with the size of the club and quality of the players we've got," Adams told BBC Sport. "The only thing we'll be focusing on is doing everything we can to change it. Promotion will always be the target. We're still capable of that."